The paper focuses on a power control mechanism and proposes a novel approach for dynamic adaptation of femtocells' transmitting power. The basic idea is to adapt the transmitting power of femtocells according to current traffic load and signal quality between user equipments and the femtocell in order to fully utilize radio resources allocated to the femtocell. The advantage of the proposed scheme is in provisioning of high quality of service level to the femtocell users, while interference to users attached to macrobase station is minimized. The paper proposes the power adaptation algorithm and evaluates its performance in terms of mobility events, achieved throughput, and FAPs transmitting power. Performed simulations show that the proposed scheme can significantly reduce the number of mobility events caused by passerby users and thus to minimize signaling overhead generated in the network. In addition, our proposal enhances overall throughput for most of the investigated scenarios in comparison to other power control schemes. In the recent years, the demands for high data rates have been driven by introduction of new wideband services for mobile users. The contemporary studies demonstrate that more than 50% of voice calls and more than 70% of data traffic originates from indoors . The main problem of current wireless networks working in the higher-frequency bands (above 1 GHz) such as 3G or 4G networks is a poor indoor coverage. Hence, to support high-quality multimedia services in that kind of scenarios is a challenge. The promising way for guaranteeing high data transmission for indoor users is represented by femtocell access points (FAPs). The FAPs are portable low cost base station deployed, for example, in the household or office. The connection of the FAPs with a cellular network is ensured over a broadband connection such as DSL, cable modem, fiber optic, or wireless link. The FAPs can operate in three different access control modes: closed access, open access, and hybrid access [2, 3]. A closed access mode corresponds to the case when only small group of users are allowed to connect to the FAPs. The users, who are permitted to access the FAPs, are determined according to a closed subscriber group (CSG) list. This option is suitable for FAPs owners who do not wish to share their backhaul link for which they have to pay. On the other hand, an open access mode is allowing all passersby users to access the FAPs. The FAPs operating in open access can help to alleviate traffic load of macrobase stations (MBS) by serving some of its users. The last access mode, that is, hybrid access mode, is a sort of compromise between the closed and open access. A certain part of the FAPs bandwidth is always dedicated for users belonging to the CSG, while the rest of the bandwidth can be utilized by all passing users. Various options of frequency allocation are considered for the FAPs and MBS . First, separate frequency for the MBS and FAPs can be utilized. Consequently, no interference between MBS and FAPs occurs. On the other hand, this option is not always possible, as free radio spectrum may not be available for the FAPs. More than that, this approach significantly reduces the spectrum efficiency. The second option of the frequency allocation is to use the same frequency for both MBS and FAPs. The benefit of this approach is high spectral efficiency, since all FAPs fully reuse frequency spectrum of the MBS. The evident drawback is the increase of cochannel interference between the MBS and FAPs. The last option of the frequency allocation partially shares specific amount of the bandwidth between the MBS and FAPs. The rest of the bandwidth is solely dedicated to the MBS. Thus, users attached to the MBS close to the FAPs can use different frequency spectrum than the interfering FAPs. Many technical studies have been already performed to analyze the advantages of femtocells implemented in the network (see, e.g., [5, 6]). Technical challenges, which must be solved to fully utilize femtocells potential, are described in . One of the most important problems regarding femtocells is how to avoid the harmful interference either to the MBS or to the neighbor FAPs if the same spectrum is utilized by the MBS and FAPs. The effective way of interference avoidance is an appropriate power control mechanism allowing adaptation of FAPs transmitting power. To that end, the aim of this paper is to propose a novel power control mechanism. The idea is to decrease transmitting power of the FAPs to fully utilize its frame while requirements of all users attached to the FAPs are ensured; that is, QoS (quality of service) requirements of the users are met. The advantage of this approach is that at light and medium traffic load, the power of FAPs can be significantly reduced. Consequently, the probability of signal leakage out of the residential house is decreased as well. This fact ensures either mitigation of harmful interference to the adjacent FAPs or to MBS's users (in case of closed access) or a reduction of undesired mobility events (in case of open access). The principle of the proposed scheme and performed simulations are described for LTE-A system according to release 10 . However, the general principle may be used in other contemporary technologies such as WiMAX or former LTE versions. In LTE-A technology, the data can be transmitted either in TDD or FDD manner. Without loss of generality, the rest of the paper assumes only FDD frame, since TDD frame has only different structure. In addition, the paper assumes only FAPs with open access. Nonetheless, the whole idea can be applied to FAPs with closed access as well. The rest of the paper is organized as follows. Section 2 discusses the related works concerning the power control in femtocell environment. The next section provides description of the proposed power control technique. It is logically divided into five subsections. The assessment of parameters influencing frame utilization is delivered in the first subsection. The second subsection analyses the dependence of frame utilization on FAPs transmitting power. A relationship between the probability of generated mobility event and FAPs transmitting power is contemplated in the third subsection. The fourth subsection is dedicated to the description of the proposed power control algorithm. The requirements of the proposed mechanism on existing networks are contemplated in the last subsection. The system model and simulation results are presented in the two following sections. The last section gives our conclusions. The power control mechanism may be implemented either in an uplink or in a downlink direction. In the former case, a transmission power of user equipment (UE) is adapted. In the latter case, an adaptation of FAPs transmission power is accomplished. The power control in uplink is addressed, for example, in [9–11]. Regarding the power control in downlink, which is the focus of the paper, several mechanisms have been already proposed. Generally, two different approaches are followed regarding the downlink power control in femtocell's environment. According to the first approach, the main aim is to completely cover a specific area of certain radius (e.g., to ensure the whole house coverage). The advantage is that users are always able to connect to the FAPs when inside the building. Nevertheless, the signal leakage out of the building boundaries may be significant. The primary goal of the second approach is to set the transmitting power of FAPs to minimize interference to passerby users or neighboring FAPs. The disadvantage of this approach is that the coverage of whole building is not always assured, especially if the FAPs are positioned close to the building boundary. In [12, 13], authors suggest autoconfiguration schemes (representatives of the first approach) and self-optimization schemes (representatives of the second approach), respectively. While the autoconfiguration schemes provide an initial power setting of the FAPs, the self-optimization schemes try to optimize the FAPs transmitting power during a normal operation. Authors distinguish three autoconfiguration schemes: (i) fixed power, (ii) distance based, and (iii) measurement based. When fixed power configuration scheme is utilized, the transmitting power is set to fixed value (authors consider −10 dBm). Disadvantage of this method is that the FAPs coverage strongly depends on the distance from the MBS. This drawback is eliminated by the distance or measurement-based approaches. In these cases, the FAPs power is configured so that the received signal from the strongest macrocell and the FAPs are the same at a defined target cell radius. Usually, the target cell radius corresponds to the maximum distance from the FAPs where a UE attaches to the FAPs rather than to the MBS. The performance of autoconfiguration schemes is analyzed in terms of the number of mobility events (i.e., number of the handovers or their initiations) for the different FAPs positions within a building. Although the distance and measurement-based methods outperform simple fixed power autoconfiguration scheme, the number of registered mobility events is still high and unsatisfactory (especially for the scenario if the FAPs are positioned close to the house boundary). Further improvement is achieved by the introduction of the self-optimization schemes. Three self-optimization schemes are proposed in [12, 13]. Generally, all self-optimization schemes aim to minimize the number of mobility events based on their measurement. Consequently, the FAPs must be able to collect statistical information regarding the mobility events. The first scheme forces the adaptation of FAPs power only according to the mobility events generated by passing users. The advantage is that the number of outdoor mobility events is significantly minimized. Nevertheless, the number of indoor mobility events may be high. This disadvantage is eliminated by the second proposed self-optimization scheme when the FAPs tries to minimize all mobility events. The last scheme exhaustively searches over all possible power settings and the power of FAPs, during which the smallest number of mobility events occurred, is regarded as the optimum. However, as this approach is not really practical, it serves only as a benchmark. The numerical results demonstrate that self-optimization schemes noticeably outperform all autoconfiguration methods. As already stated, the main disadvantage of all self-optimization schemes proposed in [12, 13] is that UEs inside the house are not always able to attach to the FAPs as the full house coverage is not ensured. In , the authors additionally contemplate another autoconfiguration scheme taking activity/inactivity of users into consideration. If no users of the FAPs are currently active (no voice or data are transmitted), the transmitting power of FAPs are decreased by 10 dB. At the same time, the FAPs user's idle mode cell reselection threshold is decreased by 10 dB to guarantee that the UEs remain connected to the FAPs. However, even with this improvement, the autoconfiguration scheme is outperformed by the above-mentioned self-optimization schemes. Two more power schemes, which represent the second approach, are introduced in [15, 16]. In , the authors propose an adaptive coverage adjustment (ACA) algorithm. The aim of the paper is similar to the self-optimization schemes proposed in [12, 13], that is, to minimize mobility events and to reduce signal leakage. If the UE currently attached to the MBS is in close vicinity of a FAPs, the FAPs itself iteratively decreases its transmit power as long as the passing UE is in FAPs range. After specific time period when the UE moves away from the FAPs coverage, the FAPs increases power to the initial value. Nevertheless, this scheme is not able to fully mitigate the redundant handovers, since the decrease of power is done after reception of handover request at the side of FAPs. In , self-optimization scheme allowing the FAPs to adaptively adjust transmitting power is presented. The proposed scheme is composed of two steps. In the first step, the self-configuration of the FAPs transmitting power is accomplished. In the second step, the adaptation of current transmitting power according to radio environments obtained by measurements is performed. The aim of the authors is like as described in [12, 13], that is, to minimize interference caused by the FAPs to passersby users while to achieve sufficient indoor coverage. However, the authors do not use the number of generated mobility events but consider leakage of the FAPs signal for its power adaptation. Other two studies proposed to control FAPs transmission power in dependence on current traffic load of the FAPs. In , the authors contemplate the possibility to adapt transmitting power of FAPs based on traffic density. The proposed scheme suggests observing the length of queue at the FAPs. If the queue is filled at a certain level given by proposed parameters, the FAPs transmits either at full level (at high traffic density) or at half of its full power (at low traffic density). From the results, it can be observed that transmission power can be decreased. Nevertheless, the paper does not show how the proposed scheme performs in comparison to existing power control schemes in terms of interference reduction or throughput. The second study described in  proposes a similar idea as defined in . The aim is to adapt the transmitting power of femtocells according to current traffic load and signal quality between mobile stations and femtocell in order to fully utilize data frame. The study provides only simple analytical evaluations in order to demonstrate the effect of proposed principle on FAPs transmitting power. The work in this paper is based on the idea introduced in . In comparison to , the paper proposes a whole new algorithm enabling FAPs to adapt their transmitting power and contemplates its applicability to existing LTE networks. In addition, extensive simulations emulating real scenarios with FAPs are undergone. The aim of the proposed scheme is to find the optimal tradeoff between both of the above-mentioned approaches by elimination of their weaknesses. On one hand, our objective is to minimize the number of undesired mobility events in a similar way as the proposals based on the second-approach aims. However, at the same time, the goal is to keep the same QoS level to the FAPs users as in case of the first approach. The general principle of the proposed scheme is depicted in Figure 1. The left part of the figure shows the case when the transmitting power of FAPs are adjusted to achieve (carrier to interference and noise ratio) at radius , which could correspond, for example, to the house boundaries. If the channel quality, characterized by the , at the side of both UEs is distinguishable higher than and the radio resources of the FAPs are not fully utilized, the FAPs transmitting power is decreased, while no negative impact on QoS is observed. 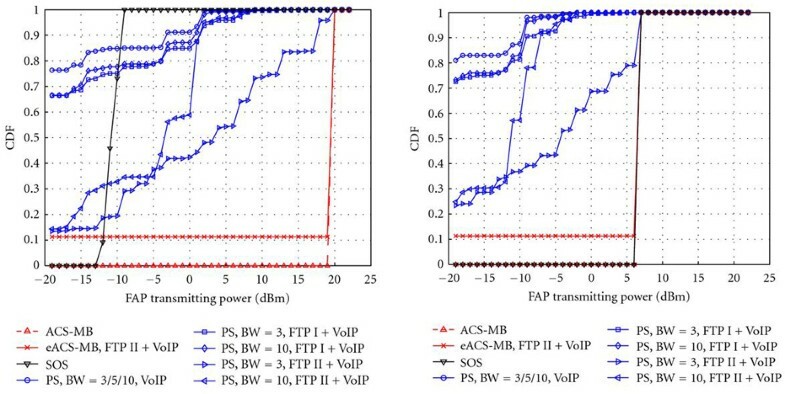 The power is adjusted to such value when the received signal from the FAPs at the side of both UEs is still acceptable (in Figure 1(b) depicted as ) and that all data can be still transmitted. The proposed scheme adjusts transmitting power of reference signals (RSs), whose purpose is to estimate channel quality, and data. In our proposal, we assume that the data in DL direction are transmitted with the same power as RSs. Thus, an opportunistic decrease of transmitting power of RSs helps to minimize the number of mobility events, since the handover is initiated according to received quality of RSs . Basic principle of the proposed scheme. Actual frame utilization must be known at the side of FAPs to estimate current appropriate transmitting power of FAPs ( ). According to , the LTE-A frame is composed of 20 slots with 0.5 ms duration in a time domain. Every two slots create one subframe, and ten subframes form one LTE-A frame. Furthermore, one slot includes seven OFDM symbols (or six OFDM symbols if extended cyclic prefix is considered). Depending on channel bandwidth, the frame structure could be decomposed in a frequency domain into certain number of subcarriers, and every twelve subcarriers form one resource block. The resource block consists of the so-called resource elements representing one subcarrier in the frequency domain and one OFDM symbol in the time domain. For the purpose of our proposed power control scheme, it is necessary to analyze aspects influencing current frame utilization and relationship between FAPs transmitting power and its frame utilization. These issues are addressed in the next two subsections. where and represent the number of resource elements appointed to control information and data, respectively. Thus, as long as , the frame is not fully used and some resources are still free. The number of resource elements carrying overhead depends on system configuration and usually varies between 15% and 30% of (see ). where is the number of users attached to the FAPs and is the amount of data send to user during frame . In general, the number of resource elements used for data transmission is proportional to the amount of generated data in the downlink direction. The last aspect influencing current frame utilization is represented by a transmission efficiency . The parameter determines the amount of bits sent via one resource element, that is, the number of bits sent over one subcarrier in the frequency domain and one OFDM symbol in the time domain. The parameter Γ is dependent on chosen modulation and coding scheme (MCS) assigned according to the received . In the paper, the MCS is selected in the line with  as indicated in Table 1. Transmission efficiency depending on CINR . where is the transmitting power of FAPs, corresponds to the signal attenuation between a transmitter and a receiver, and stands for the noise plus interference. Thus, the proposed power mechanism tries to achieve certain target frame utilization by changing of FAPs transmitting power in dependence on current traffic load and channel quality between the FAPs and UEs. Figure 2 shows the example how the frame utilization is influenced by FAPs transmitting power. The frame utilization is calculated for one active UE positioned 2 m from the FAPs without any obstacles between the transmitter and receiver. Furthermore, two bandwidth sizes allocated to the FAPs are considered, while three different traffic loads are generated in DL direction. It is illustrated that with increasing of FAPs transmitting power the frame utilization is decreasing. In general, the higher frame utilization is observed if the offered traffic load is higher and narrower channel bandwidth is used for the same transmitting powers. From Figure 2, optimal levels of power allocated to the FAPs could be further derived when the frame utilization is either equal to 1 or lesser. The reason for constant frame utilization for FAPs power levels between −2 and 21 dBm is that the highest MCS is used. Thus, the amount of radio resources allocated for data transmission is still the same. where and are pilot's signal levels received from a target station (station to which the UE is supposed to be connected after handover), and a serving station (station to which the UE is attached before handover), respectively, and represents hysteresis margin for avoiding redundant handovers. Furthermore, in order to prevent any other unnecessary handovers, its initiation is postponed by handover delay timer . If we consider handover from the MBS to FAPs, that is, is the transmitting power of the MBS and corresponds to transmitting power of FAPs, it is apparent that a probability of handover decreases with lowering of FAPs transmitting power. Since the goal of the proposed power control is to fully utilize the frame by decreasing of FAPs transmitting power, the overall number of performed handovers may be potentially minimized as proved by simulation results in Section 5. Table 2 summarizes a notation used in the description of the proposed algorithm. The dynamic adaptation of transmitting power is done every adaptation interval . Firstly, the current frame utilization in the downlink direction is estimated. Whether the transmitting power of FAPs are increased, decreased, or remains the same depends on several parameters: current frame utilization , average CINR between individual FAPs and its UEs, and current transmitting power of the FAPs . Depending on traffic load in framek representing UEs activity and the current frame utilization , three cases may occur: Case I ( and ), Case II ( and ), and Case III ( , or , while not all data are sent from the FAPs to UEs due to congestion). The target frame utilization represents a value, which the algorithm aims to reach. In general, the can take the values between 0 and 1. The paper assumes the value of is equal to 1 as the objective is to fully utilize the frame (the finding of optimum value for from the packet delay point of view is an item for future study). The Case I occurs when all UEs connected to the FAPs are in inactive state ( ). In order to minimize potential interference to passerby users, the transmitting power of the FAPs are automatically set to its minimal value . To prevent the handover of UEs in idle state to other station with higher transmitting power (either to MBS or to adjacent FAPs), the handover threshold is decreased accordingly. The Case II corresponds to the situation when while some of the UEs are active ( ). As Figure 3 indicates, the transmitting power of FAPs can be either increased or decreased. The power has to be increased if at least one UE attached to the FAPs are receiving weak signal (i.e., there exists ) to avoid possible termination of data transmission by this UE. The fading margin guarantees that the UE is not disconnected due to fading effects. In addition, the power of FAPs are incremented by power adaptation step only if the new value would not exceed . The principle of power adaptation algorithm for Case II. On the other hand, the power is decreased if all UEs connected to the FAPs are receiving signal with satisfying quality (i.e., for all ). The decrease of transmitting power is profitable, since the interference is minimized. Nevertheless, two more requirements need to be satisfied to lower FAPs transmitting power. The first one is fulfilled if the new transmitting power would be still above the minimal allowed value . The purpose of the second one is to avoid continuous adjustment of transmitting power when frame utilization is equal approximately to . If this problem would be neglected, the transmitting power could oscillate between two values as indicated in Figure 4(a). The oscillation is caused by the fact that as soon as , the algorithm increases FAPs transmitting power (see description of Case III below). Nonetheless, in the next adaptation cycle, the FAPs transmitting power would be again decreased (i.e., Case II would be applied). To this end, the algorithm is enhanced by the following mechanism. If the frame utilization in previous adaptation cycle is above while in the current cycle it is not (i.e., and ), the indicator is set to "1" (see Figures 3 and 4(b)). The algorithm reaches the equilibrium, since the transmitting power of FAPs are optimal as the frame utilization is closest to the as possible. The equilibrium state lasts as long as remains the same. In other words, the MCS used by all UEs is unchanged (i.e., for all ), and the amount of data generated in downlink is still the same ( ). Otherwise, the indicator value is reset to "0", and new transmitting power achieving the equilibrium is found. Avoidance of FAPs transmitting power oscilation. The last case (Case III) represents the situation when the FAPs current frame utilization is above target frame utilization (i.e., ) or when and the FAPs are at the same time overloaded. The transmitting power of FAPs are either set directly to or increased by (see Figure 5). The FAPs power is set to its maximal level only when it is overloaded. The reason for immediate rise of the FAPs power to is to ensure that data transmissions are not necessarily delayed by proposed mechanism as in the case of gradual increase of the FAPs power would be. Nevertheless, the power is set to only if at least one of the UEs attached to the FAPs experiences channel quality in downlink below . If this is not the case (for all ), the increase of power would be pointless, as already all UEs connected to the FAPs use the best MCS. Hence, the frame utilization would not be lowered despite the increased transmitting power. The principle of power adaptation algorithm for Case III. The FAPs power is incremented only by when . In this situation, the generated data can be still transmitted and adjusting of the FAPs power by is sufficient. Before increase of the FAPs transmitting power is accomplished, two conditions must be satisfied. The first condition is the same in the previous case; that is, there exists . The second condition is that the FAPs transmitting power incremented by a power adaptation step does not exceed maximal allowed value . So far, we have assumed the power adaptation is done in such manner that all UEs attached to the FAPs would experience satisfying signal quality regardless of their activity/inactivity. Nevertheless, if for example, only one UE in close distance to FAPs are active while the rest of attached UEs are inactive, it is profitable to adapt transmitting power to guarantee good channel quality only between the active UE and the FAPs. In case when inactive UE changes its status to active, the FAPs can automatically increase transmitting power to cover this newly active UE. The merits of both proposed algorithm options are analyzed in Section 5. The optimal value of is found experimentally by means of performed simulations addressed in Section 5. In the proposed algorithm, it is assumed that the adaptation step has constant size. However, the adaptive size of can be utilized for our purposes. Similarly, as in case of , this issue is an item for further future research. The advantage of our proposed power control mechanism is that it needs no additional hardware modifications to the MBS, FAPs, or UE. The only requirement is that the FAPs are capable to adjust its transmitting power by optimized adaptation step . Nevertheless, this functionality is required by all existing power schemes. Regarding software changes, the FAPs firmware needs to be updated to support proposed power adaptation algorithm. The algorithm computational complexity is low, since no difficult calculations are done; only several simple conditions are evaluated during every power adaptation cycle . As a consequence, the FAPs have to collect information regarding the channel quality of all its users in DL every adaptation cycle as well. Since in LTE, a periodic CINR measurement and its reporting can be scheduled from 2 ms to 160 ms , we consider values of varying between 10 ms to 80 ms. Thus, the proposal does not unnecessarily increase reporting overhead or FAPs processing load. 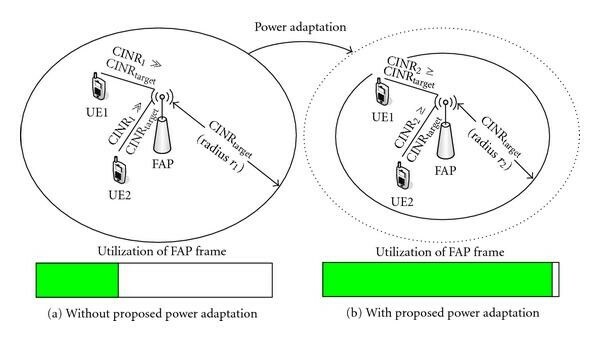 In order to implement the proposed algorithm to femtocell environments, two requirements need to be fulfilled: (i) the FAPs has to be aware of UEs' individual CINR and (ii) the FAPs has to able to evaluate current frame utilization in downlink direction. As mentioned earlier, the measurement of channel quality and its reporting to the FAPs are inherent procedure necessary for all wireless mobile technologies. Consequently, the FAPs can adjust the transmitting power as described in previous subsection. In addition, the other advantage of the proposed mechanism is that it does not increase the signaling overhead due to reporting of CINR as the reporting has to be done independently on the proposed power scheme. The second requirement is also satisfied, since the FAPs are continuously aware of downlink traffic and allocates radio resources to UEs. Thus, the FAPs are able to easily determine current frame utilization essential for proposed power adaptation scheme. All simulations are performed in MATLAB environment. The parameters' setting is given in Table 3. The simulations are done for FDD LTE-A system. The amount of overhead in the frame is derived from [8, 20] for configuration with one transmitting antenna and varies between 25.8% and 27.6% depending on the selected bandwidth. The system model contains one hundred terraced houses with structure according to . Every second house is equipped with one FAPs. A disposition of individual houses and MBSs is illustrated in Figure 6. 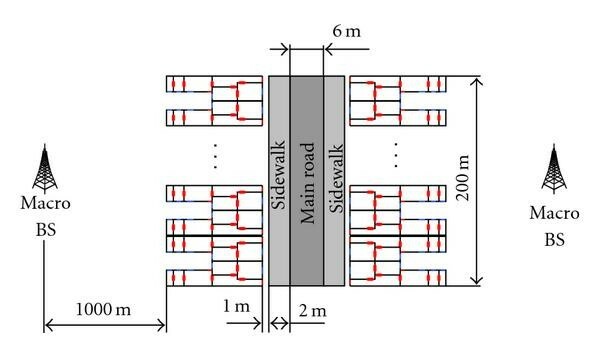 The considered scenario is selected intentionally, for it is very challenging as the households are in close proximity of a sidewalk and windows face the sidewalk. Hence, significant amount of undesired mobility events may occur. The outdoor users are moving only within sidewalk's boundary in the direction from the south to the north. An initial position of each user is selected at the south boundary of the sidewalk. The distance from the house is selected randomly in range from 1 m to 3 m of the house. Subsequently, the user starts moving in northern direction with speed of 1 m/s along the straight trajectory. As soon as the UE reaches northernmost point of the sidewalk, it is discarded from the system. The intensity of UEs arrival to the system follows Poisson distribution and is approximately 70 passing users per one hour. Every FAPs serves up to four UEs, which is the maximal number of active UEs supposed to be served simultaneously by one FAPs . The movement of UEs within house is managed differently when compared to outdoor users. The UE is moving with speed of 1 m/s along indicated trajectories as shown in Figure 7. At each point of decision, the UE randomly selects the next moving direction with equal probability to all possible destinations. For instance, if the user can move to three different waypoints, the probability for each waypoint is 1/3. The UE spends a certain amount of time at a waypoint. After that, it moves to the next selected waypoint. The time spent by a user at the waypoint is described by normal distribution and differs for each room (parameters μ and σ of the distribution are derived from ). Indoor mobility model [ 13 ]. Figure 7 further shows the position of FAPs considered in the performed simulation. Several FAPs positions are chosen along the arrow in Figure 7 within the simulation. 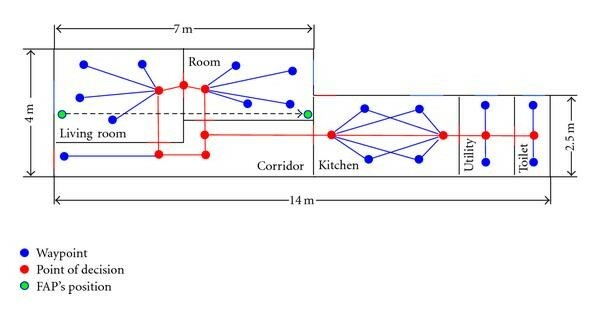 The position of FAPs directly next to the window represents the worst case scenario (highest number of undesired mobility event is generated), the position approximately in the middle of the household corresponds to the best scenario as the signal from the FAPs are highly attenuated by the walls. Since the performance of proposed mechanism strongly depends on the amount of generated traffic by indoor users, two traffic model types based on  are defined. First traffic model type is an FTP model representing data transmission scenario. More than that, two types of the FTP model are considered (denoted in simulation as an FTP I and an FTP II). While the FTP I generates roughly 380 kb/s at an average per the simulation (corresponding to the light traffic case), the FTP II generates roughly 4.4 Mb/s at an average (corresponding to the heavy traffic case). The second type of model is a VoIP model representing voice transmission. Two path loss models are assumed. To simulate path loss in indoor environment, ITU-RP.1238 model is implemented. The path loss model for outdoor environment is based on Okumura Hata empirical model. Both path loss models are chosen, since these are widely used in evaluation of femtocell concept . More detailed parameters of both models can be found also in . The performance of the proposed mechanism is demonstrated through the number of mobility events generated per whole simulation depending on the position of the FAPs within the household. The mobility event is triggered if pilot signal received from new cell is higher by 4 dB than from serving cell for a time of 500 ms (the values are taken from ). The simulation monitors both outdoor and indoor mobility events. Moreover, the throughput and level of transmitting power for selected scenarios is analyzed. Figure 8 compares the performance of several scenarios in terms of the number of mobility events. The scenario denoted in all following figures as "ACS-MB" represents auto-configuration scheme based on measurement of the mobility events proposed in . This scenario serves as a benchmark, since the observed number of mobility events are normalized to its maximal value at FAPs distance of 0.5 m from the house boundaries. The scenario labeled as "eACS-MB" enhances simple ACS-MB as explained in . However, in case of FAPs inactivity, the power is decreased to (not by 10 dB as described in ) for fairly comparison with our proposed scheme. Note that eACS-MB represents the best performing power control scheme based on the first approach. The next considered scenario labeled as "SOS" corresponds to self-optimization scheme proposed in  minimizing the number of mobility events at the cost of worse FAPs indoor coverage (based on the second approach). Figure 8 illustrates the number of all generated mobility events, that is, both indoor and outdoor mobility events. The performance of proposed scheme is expressed by scenario depicted as "PS I" and "PS II". In the former case, the algorithm guarantees that all UEs in the house receive signal from the FAPs with satisfying quality regardless on their activity/inactivity. The latter case represents the situation when the FAPs adjust their transmitting power to serve only currently active users. Normalized number of mobility events depending on FAPs position, FTP I, MHz. The worst performance is observed by ACS-MB, where significant number of the mobility events is generated. Especially if the FAPs are close to the house border, the passersby UEs are forced to perform the handover from the MBS or adjacent FAPs very often. Although the situation is improved by eACS-MB, which reduces the number of mobility events approximately to 50%, the results are still unsatisfactory. The overall number of mobility events decreases as the FAPs are placed closer to the house centre. The sharp drop of the mobility events between 3.5 m and 4 m is due to two reasons. The first reason is that the FAPs are removed from living room to the next room (see Figure 7). Thus, the FAPs power leakage out of house is reduced by attenuation of internal wall. The second reason is that the FAPs are transmitting at such power level to cover whole house, and the most problematic locality in our scenario is to cover a toilet positioned furthest from the FAPs. Thus, when the FAPs are moved from living room to the next room, the power of the FAPs are reduced approximately by 5 dB. The situation is substantially improved by SOS. The number of mobility events is reduced approximately ten times (when compare to ACS-MB) and five times (in comparison to eACS-MB) for FAPs distances between 0.5 m to 3.5 m from the house boundary. The mobility events are practically eliminated for FAPs distance higher than 3.5 m. Nonetheless, drawback of this mechanism is that UEs within the house boundary are not always connected directly to the FAPs, since the signals from other stations (especially from the MBS) are stronger. In the performed simulation, the UE is served by the FAPs on average only by 47% of simulation time if FAPs position is close to the house boundary (see Table 4). Even though the results are improved for farther FAPs locations, the PS and both ACS methods always assure 100% FAPs coverage within the household. Thus, the main purpose of the FAPs, that is, to cover whole house, is not fully accomplished as in case of ACS-MB and PS schemes. More than that, the indoor mobility increases the overall number of mobility events occurred during simulation (this is notable in Figure 8 for the FAPs position between 1.5 m and 3.5 m). Percentual coverage of UEs by the FAPs. The performance of the proposed mechanism is dependent on the selection of the appropriate adaptation step . If the adaptation step is set to the default value of 0.1 dB and PS I is considered, the number of mobility events is decreased roughly to 50% when compared to ACS-MB. The obtained results are only slightly better than in case of eACS-MB. Further minor improvement is achieved by utilizing of PS II. In order to improve the results obtained by PS, the optimal value for adaptation power step is necessary to be found as described in Section 3.3. The performance of PS II is also illustrated in Figure 8 for different values of . The results indicate that the number of mobility events is noticeably decreased if appropriate value for corresponding to 2 dB is selected (no improvement for values higher than 2 dB was observed in simulations). The important outcome is that due to optimization process, the results are even better than in case of SOS for FAPs position greater than 2 m from the house's edge. The other parameters that can potentially influence the efficiency of the proposal are (i) the amount of generated traffic (in Figure 8, FTP I was used), (ii) FAPs bandwidth (in Figure 8, MHz was utilized), and (iii) the length of adaptation interval (in Figure 8, ms was considered). Note that the number of mobility events observed in case of ACS and SOS is independent on these parameters and eACS performance is influenced only by traffic type (inactivity and activity periods). Consequently, the impact of the above-mentioned parameters is investigated only on PS. In addition, from now on, only PS II utilizing optimal will be considered. Figure 9(a) takes into account simple VoIP model without any data transmission. This case corresponds to the scenario when users utilize the FAPs only to handle voice calls. The proposed mechanism always outperforms all schemes independently on the selected channel bandwidth. 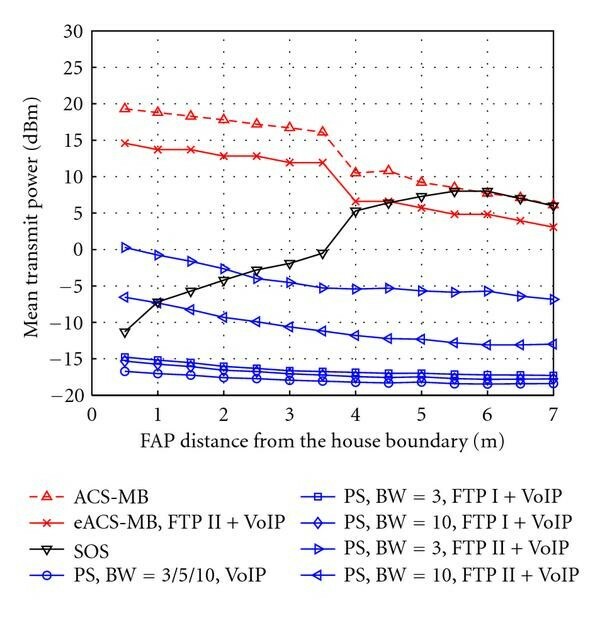 Figure 9(b) further indicates that if the FAPs transmits voice together with data (FTP I + VoIP), the results are rather in favor of PS than of SOS if the FAPs are positioned in sufficient distance from the house boundary (at least 1.5 m for MHz and at least 2 m for MHz). The performance of eACS-MB has been significantly degraded (in comparison with VoIP model) due to higher UEs activity. If the FTP II together with VoIP is used instead of FTP I, the performance of PS and eACS-MB is distinguishable worse (see Figure 9(c)). Nevertheless, the number of mobility events for PS is significantly lowered for wider channel bandwidth despite high traffic load generated by FTP II and VoIP models. In fact, the PS is still able to outperform SOS scheme if at least bandwidth of 10 MHz is allocated to the FAPs and when reasonable FAPs position inside the household is selected (at least 2 m from the house boundary). Figure 9(c) further illustrates the influence of varying on PS scheme (note that in case of VoIP and FTP I + VoIP traffic models, no negative effect on PS's performance was found). It is demonstrated that for longer adaptation intervals the number of mobility events is increased. Nevertheless, in case of 10 MHz channel bandwidth, the negative effect is insignificant as the PS still performs better for FAPs located at least 2.5 m from house edge. Figure 10 depicts the performance of individual schemes in terms of achieved throughput for selected traffic models and channel bandwidth allocated to the FAPs. For better comparison of schemes and scenarios, the throughput is normalized to the maximal value obtained during the evaluation. Furthermore, performance is analyzed only for 10 MHz bandwidth in case of low traffic load (VoIP, FTP I + VoIP), since the results for other bandwidths are similar. The scenarios labeled as "indoor" corresponds to the average throughput reached by FAPs. The aim is to achieve the same indoor throughput as in case of ACS-MB scheme for individual schemes. The reason is that ACS-MB is transmitting with highest power and provides the best house coverage. On the other hand, the scenarios marked as "overall" represent the throughput obtained by the FAPs and MBS together. Consequently, these scenarios show the negative effect of FAPs on passersby users attached to the MBS, since higher FAPs transmitting power lowers the CINR experienced by passerby UEs. If the PS scheme is used, the FAPs are always able to serve the same amount of data as in case of ACS-MB or eACS-MB. This is not valid for SOS method, as indoor users are not attached to the FAPs all the time. Consequently, the MBS has to serve these users which degrade the overall throughput. This is notable especially for heavy traffic load when FTP II together with VoIP is used for indoor users. Figure 10 further indicates that simple ACS-MB significantly degrades performance of outdoor users. Nevertheless, if the FAPs are close to the middle of house (FAPs distance from the house boundary is at least 6 m in our scenario), the results are comparable to SOS scheme as the FAPs transmitting power is the same for both methods. Significantly better results than those reached by ACS-MB are observed for eACS-MB when the results are even better than for SOS scheme. Nonetheless, this is true only for VoIP and FTP I + VoIP models. If FTP II + VoIP model is implemented, eACS-MB surpass ACS-MS only slightly, while SOS offers better result for FAPs position up to 5 m from the house boundaries. Figure 10 also demonstrates that the PS scheme outperforms all conventional schemes in term of overall throughput for VoIP and FTP I + VoIP traffic loads. In case of heavy traffic load, our proposed scheme has always better results but for SOS scheme. Nonetheless, PS is still better than SOS scheme if the FAPs distance from house boundaries is at least 4 m (for bandwidth equal to 3 MHz) or 1 m (for bandwidth equal to 10 MHz), respectively. Although the SOS outperforms our schemes for FAPs position closer to the sidewalk, the performance of SOS scheme in general terms is not satisfactory. The main reason is that the FAPs transmitting power is adapted in dependence on the number of mobility events. Thus, the CINR experienced by passerby UEs is very low as the signal strength received from msB is only marginally higher than signal received from the FAPs; that is, low efficient MCS has to be utilized. Figure 11 depicts the mean value of FAPs transmitting power for selected scenarios considered in Figure 9. The highest transmitting power is reached for ACS-MB scheme, which is varying between 19 dBm and 6 dBm over the distance between the FAPs and the house edge. The mean transmitted power of the proposed power control mechanism varies between 0 dBm to −18 dBm depending on current traffic model type, channel bandwidth, and FAPs position. All power control methods except of the SOS show gradual decrease of transmitting power if the FAPs location is moving from the house boundary to the centre. The mean transmitting power of FAPs increases for SOS, since this scheme attempts to maximize indoor coverage. Consequently, as the FAPs position is successively farther from the house boundary the transmitting power can be continuously increased, while the interference to outdoor users is not. It is clear that in case of SOS scheme, the mean transmitting power is always higher then PS for FAPs distance between 2.5 m and 7 m. In addition, also eACS-MB method achieves lower mean transmission power for FAPs location between 5 m and 7 m. Figure 11 further indicates that the proposed scheme has also a potential to save power energy. Mean transmit power of FAPs. Figure 12 illustrates a CDF of FAPs transmitting power for two FAPs position. In general, the results are comparable to the outcomes described in previous figure. More than that, it is clear that the transmitting power in case of the proposed scheme is much more varying than in case of ACS-MB and SOS schemes. This is due to the fact that the proposed scheme adjusts dynamically transmitting power according current conditions. Distribution of FAPs transmitting power, distance of FAPs from house boundary 0. 5 m (a) and 7 m (b). Figure 13 shows an example of distribution of the frame utilization during the whole simulation time for heavy traffic load. Furthermore, only two scenarios differing in FAPs bandwidth are taken into account, for each investigated scheme. In general, the lowest frame utilization is obtained for ACS and eACS. This is due to the fact that in case of both schemes, the FAPs are transmitting with highest power (at least if one of the indoor UE is active). Figure 13 further illustrates that the PS scheme frame utilization is the highest, which is the consequence of proposed principle to maximize FAPs frame utilization. A difference between PS scheme and other schemes is more significant especially for broader channel bandwidth. Distribution of frame utilization for FAPs distance of 0. 5 m from house boundary, FTP II + VoIP model, MHz (a) and MHz (b). The paper proposes the power control mechanism, which dynamically adapts the transmitting power of FAPs depending on the current traffic load and signal quality received at the side of UEs. The results demonstrate that the optimized PS mechanism significantly outperforms both evaluated ACS schemes. Despite of this, the PS is able to guarantee the same QoS to FAPs users as in case of ACS-MB or eACS-MB. When compared to the SOS trying to mitigate mobility events while maximizing indoor coverage, the results achieved by our power control method are always better as long as the generated traffic is at light or medium levels and sufficient amount of radio resources is allocated to the FAPs. Nonetheless, with optimized power adaptation step equal to 2 dB, the PS outperforms SOS also at heavy traffic load if sufficient amount of radio resources is allocated to the FAPs while they still enable the coverage of all users in the house. The further benefit of the proposed power control scheme can be seen in its potential to minimize overall power consumption by the FAPs. In the future, our intention is to investigate the impact of adaptive power control step and to analyze the effect of different target frame utilization on the system performance. This work has been performed in the framework of the FP7 Project FREEDOM IST-248891 STP, which is funded by the European Community. The authors would like to acknowledge the contributions of their colleagues from FREEDOM Consortium (http://www.ict-freedom.eu/).